"I won't know anyone and will feel uncomfortable." These are just a few of the excuses we hear every day and we can't wait to help you overcome your doubts and fears! No matter where you're at now physically or how nervous you are about getting started, Moms on the Run has a program for you! Stop thinking you could never be active and start believing that you can achieve your fitness goals! Moms on the Run can help. We are not a running club. Moms on the Run is an instructor-led fitness program with coaching to motivate, educate and encourage you on your health and fitness journey. Make new friends, find accountability and have fun while working toward a healthier lifestyle! You don't have to be a mom to join Moms on the Run. We welcome ALL women, ALL ages and ALL fitness levels. We offer programming for walkers to beginning runners to experienced runners. Walkers will be encouraged to follow an interval training schedule (easy walk/faster walk) designed to maximize their fitness levels. Our “Learn to Run” program begins with walking and gradually transitions to more running or consistent run/walk intervals. Experienced runners will be challenged to improve their times and endurance. ​Each class includes strength, stretching and cardio training. Accountability + Motivation through Coaching and Friendships = SUCCESS! One of the key factors in sticking with a workout program is accountability. When friends are waiting and coach is calling to check in our chances of success increase! ​Exercise partners provide a powerful combination of support, accountability, motivation and, in some cases, healthy competition. 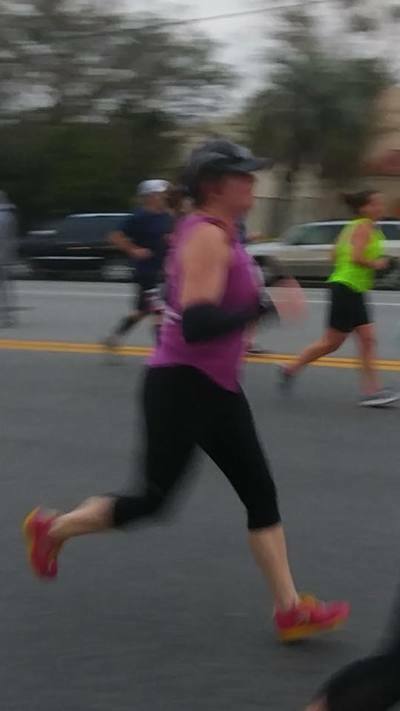 In addition to the in-class support from coaches and friends, Moms on the Run Jax has a dedicated private Facebook group where we share successes and setbacks, plan group runs outside of class and where your coach will post at-home workouts to keep our activity levels high on off-class days. Each season, we organize fun outings such as yoga on the beach, ladies nights out and group events at our local running store and partner physical therapy locations. ​Moms on the Run is more than a workout class or traditional running club. We count on each other for support and friendship. After all, our motto is Fitness, Fun & Friendship! Our Spring 2019 season runs January 21st - May 26th (18 weeks). Registration is open throughout the season with pro-rated pricing each week so joining anytime during the season is encouraged! Moms on the Run can accommodate your current fitness level into our program at any time during the season so don't worry if you're jumping in after the kick off date! We offer weekly classes that include "Learn to Run", Intermediate and Advanced programs. No woman is left behind! Work up to your first 5k, build strength to combat aging and help with weight loss goals, increase endurance to achieve longer distance goals, improve speed and fitness and meet new friends all while having fun! All classes include a combination of cardio (walking, run/walk or running) and body weight or small dumbbell/resistance band strength exercises. All you need are some running shoes and a yoga mat. Our 60 minute signature class includes 35 minutes of cardiovascular interval training for all levels, a warm-up and cool-down, 10-15 minutes of strength training, and 5 minutes of stretching. Interval training improves strength, speed, cardiovascular fitness, metabolism and running performance. ​Strength is an integral part of training as a runner. In order to run strong, we must BE STRONG! Strength work focuses on runner specific exercises that will help us avoid injuries, tone and tighten muscles and run longer and faster! ​Sundays (Endurance/Destination Run) 6:00am - 8am - Starting location/route changes weekly (location announced through email and in our private FB group) Dynamic warm up starts at 6am. We will run for 45-90 minutes (depending on fitness levels and mileage needs) then come together for stretching and strength exercises. Different starting location/route each week but will stay in and around the Jacksonville area. Routes include Mandarin, Lakewood, San Marco, Riverside, Ortega, Orange Park, Southside, Jax Beaches, and Nocatee. Details are given in advance so you can plan ahead for driving time. We run on "seasons" with a few shorts weeks break in between. Our Spring season runs the end of January through the end of May. We pick back up a few weeks into June and run through August, then break for back to school and run again Labor Day through December. It's always a good time to join us! No matter when you join, you will start at your current level of fitness. ​Pro-rated pricing is available throughout the season ​and monthly payment plans are available. If you have questions about which option is best for you, contact us through email, Facebook or call Coach Amy and let's chat! Our Spring season has started and pro-rated season rates are available. Please contact Moms on the Run Jacksonville for pricing based on your start date. ​discount code in our private MOTR Jax Facebook group or email us at Jacksonville@momsontherun.com. ​Attend 1 class each week. You may choose either of our weekday Signature classes or our Sunday Endurance Run + Strength session. You do not have to attend the same class each week. (Program includes MOTR top and FB accountability group. Attend two classes per week. You may choose two weekday classes or one weekday class and our Sunday Endurance Run + Strength session. You may choose a different combination of classes each week. ​(Program includes MOTR top and FB accountability group. Attend 2 one hour Signature Training Classes PLUS our two hour Sunday Endurance Run + Strength session each week! Get all your workouts done with your Coach and friends! 3 runs per week PLUS strength training, stretching and friendship! Perfect option if you don't want to workout/run alone, if you prefer workouts with your coach to ensure safety and proper form, if you need accountability to get it all done, if are looking to run your first 5K or are training for the Gate River Run or a Marathon! This option offers the ultimate flexibility for those who have an unpredictable schedule or travel often and want a moderate commitment level to keep them on track to reach their health and fitness goals! ​Attend any combinations of Signature and Endurance classes (up to 20 sessions) throughout the Spring program. Try a class or come for a drop in! This option does not include access to our private group page or a MOTR shirt but we always love to have guests join us for a run and workout! ​Not sure what class package is best for you? Below is a quick breakdown of our options. If you choose 1-3x per week, you are able to come to any 1-3 classes every week. Once the week is over, those classes are gone so if you miss them there is no make up class. These options are less expensive per class and are best for those who want committed weekly workouts. If you are just getting back to exercising, are training for a race or need accountability to ensure your success, these options are for you! If you choose the Flex Pass 20, you have the option to come to 20 classes of your choice throughout the season. They do not have to be on a specific week or day. This option is a higher cost per class but gives you the flexibility to choose when you will come and allows you to miss a week or two at a time without giving up any of your classes. If you travel often or have a schedule that changes, this is a great option for you! Join the MOTRvate 28 challenge by January 31st! The cost for this 28 challenge is $28. Everyone who completes the challenge will earn a fun MOTR prize pack of several items, valued at $30+! Earn points in several healthy lifestyle categories — including cardio exercise, strength training, hydration, nutrition, sleep, self-care — and post every weekend in the MOTR Jax private page and MOTR national Facebook page for your chance to win local and National prizes each week! In addition, watch for fun bonus opportunities on Facebook throughout the challenge. Our mission of fitness, fun and friendship embodies all the same dreams as the Girls on the Run program. We believe that instilling a sense of self-worth, building confidence and teaching leadership skills to our girls at a young age will help them grow into strong, active and empowered women. MOTR Jax is excited to work with Girls on the Run as SoulMates, Coaches and running buddies for the GOTR end of the season 5K events. This partnership will bring together like minded women who want to get healthy, have fun and form great friendships while giving back to their community through supporting our youth. Together we can make the future of our women and our girls even brighter! Discounts are available for Girls on the Run Moms, Soulmates and Coaches! Please email us to receive your discount code for any of our class packages. Hi I'm Owner and Head Coach Amy Magdalein. ​or have any additional questions please get in touch with me! ​Scroll down to see how much fun we have together! MOTR JAX END OF SUMMER 2018 PARTY! When we make fitness social and fun, we're more likely to stay committed! Our 2018 Christmas Party began with a 3-5 mile supported run from Losco Park. Then we donned our ugly sweaters, set out the sweats and treats and had a fun white elephant gift exchange!